2,300 sqm of polycrystalline photovoltaic glass manufactured by Onyx Solar will protect Plaza Olivar’s passersby and power the building. The next phase of the installation of the 5,575 sqm (60,000sqft) of Onyx Solar’s PV Glass at Bell Works’ photovoltaic skylight has begun. In August we sent the last pieces of glass to New Jersey that are being installed in this awesome building. The PV glass will enable the building to generate its own free and clean energy, and it also dresses a space for meeting and being inspired. The iconic building designed by Eero Saarinen is living a complete revitalization that has transformed the place into a mixed-used ‘metroburb,’ complete with spaces for work and entertainment. The construction has been one of the winners of Modernism at the American Awards. BUILD Magazine awarded Onyx Solar as the best global photovoltaic glass provider at the Sustainable Building Awards 2016. The magazine highlighted Onyx Solar®’s contribution to sustainable design, which plays a key role in the reduction of greenhouse gases, as well as the company’s career, involving more than 70 projects in all five continents. Onyx Solar was also awarded in the Best Photovoltaic Glass Project category for the circular crystalline-silicon skylights installed in the American Airlines Arena, home to NBA’s Miami Heat. Onyx Solar and Autodesk have agreed for the former to become CleanTech Partner of the latter. The company developing photovoltaic constructive materials has become the first in Spain, and one of few in Europe, to formalize this strategic partnership with architecture’s software giant. With this agreement, Onyx will work with Autodesk on the development of new solutions combining the powerful design software together with the technical knowledge of Onyx Solar multidisciplinary team. This recognition comes as a recognition for our work in many ways. On one hand, Autodesk has selected Onyx among thousands of companies willing to get this partnership, acknowledging our commitment toward sustainable building. On the other hand, being the first ones in Spain to achieve it allows us to stand as pioneers on the sustainable building and photovoltaic constructive materials development sector. “Green architecture, arguably the biggest single movement in the field since the emergence of modernism a century ago”. The last blog post of the Los Angeles Times journalist Christopher Hawthorne is devastating. And the comment comes to justify his critics to a survey undertaken by Vanity Fair to determine the most iconic architectural work in the last 30 years, which didn’t take into account sustainable building. 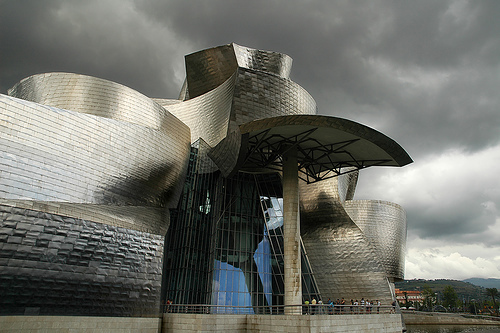 Thus, among more than 50 prestigious architects including Foster, Gehry, Hadid or Pelli; the Guggenheim Museum of Bilbao finished in the first place. As a response to that ranking, Architecture Magazine published his own survey which only considered green buildings. The winner? 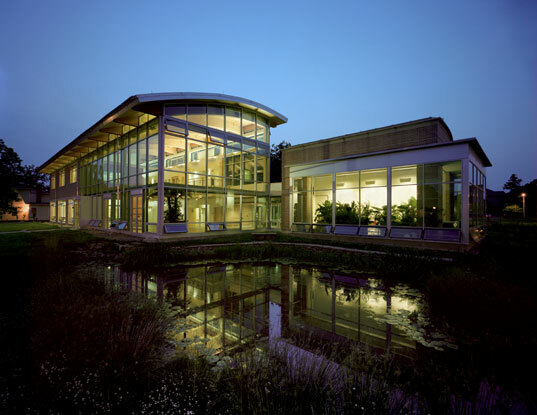 The Adam Joseph Lewis Center in Oberlín (Ohio), designed by William McDonough + Partners, followed by the California Academy of Sciences of Renzo Piano. It’s odd that the Italian architect is the only one alongside Foster that has two buildings in the ranking. Hawthorne’s article is not only interesting for checking the results of the surveys but also to put in context both rankings, and the phrase with which we started this post makes us really happy as we feel we are participating in this green movement which is becoming more and more important. Tenants in green buildings experience increased productivity and fewer sick days, says a survey. According to the study conducted by the University of San Diego and commercial real estate broker CB Richard Ellis Group, green buildings have lower vacancy rates and higher rents than non-green counterparts, reports Chris Palmeri of Business Week. Respondents of the survey said that an average of 2.88 fewer sick days in their current green office versus their previous non-green office. About 55 percent of respondents indicated that employee productivity had improved. The study also found that tenants in green buildings are more productive based on two measures: the average number of tenant sick days and a productivity change. The increase in productivity translated into a net impact of about $20 per square foot. The study also showed that green buildings have 3.5 percent lower vacancy rates and 13 percent higher rental rates than the market. Based on the average tenant salary, an office space of 250 square feet per worker and 250 workdays a year, the decrease in sick days translated into a net impact of nearly $5.00 per square foot per year. The economic impact of the total green construction market from 2000 to 2008, the study found, was $178 billion. It created or saved 2.4 million jobs and generated $123 billion in wages. The Code Council’s Sustainable Building Technology Committee (SBTC) wrapped up its work in drafting the Public Version of the new International Green Construction Code (IGCC) at its fifth and final session January 28-30 in Austin, Texas. The 29 committee members, along with dozens of Work Group participants, labored in three intense days of amendments, debates and consensus, which will result in a March 15 unveiling of the first IGCC Public Version. This will provide an immediate resource document for current efforts underway in state and local jurisdictions, as well as the basis for public comments and subsequent hearings to provide a second Public Version for consideration at the Code Development Hearings in 2011. The IGCC efforts launched last summer in Washington, D.C., with subsequent SBTC meetings in Chicago, Denver, Philadelphia, Ft. Myers and Austin. The open meetings drew a large group of observers, many of whom participated in Work Groups or in providing testimony to the drafters. SBTC Vice Chair Chris Green, representing the AIA, said the IGCC “is a game-changing code.” Green emphasized the volume and quality of work accomplished in a short amount of time, and that he and others had gained new knowledge and respect for all the participants. Code Council Deputy Senior Vice President Mike Pfeiffer served as the SBTC Secretariat. Pfeiffer announced that in addition to posting the Public Version by March 15, the Code Council Board will appoint a 12-15 person Public Comment Hearing Committee that will include some SBTC members as well as new members. The public comment deadline is May 14, with public hearings scheduled for August 14-22 in Chicago.